I’ve always loved bath soaps. Pale-green Irish Spring always reminds me of my father, because he used it every day. If I were to smell it now, I would recognize it. When I was five years old I liked Dial soap because of its happy yellow-orange color. That is until my big brother convinced me that it tasted like butterscotch and encouraged me to take a bite. I did, and quickly learned that it tasted exactly like it smelled ̶ soapy. But Ivory soap was my childhood favorite, because it floated. The same brother that had convinced me Dial was butterscotch also carved bars of Ivory into a fleet of soap boats for me that slowly transformed my bathwater into a slippery white ocean. 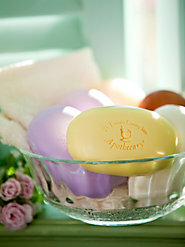 I still love soaps, especially fragranced ones. I like to have at least two different kinds open at the same time in every bathroom, so depending on my mood I can choose which to use. There’s always a big stash of different soaps in my linen closet. When a bar is reduced to a sliver too tiny to hang onto, I enjoy contemplating which soap to open next. I can’t imagine using the same soap every day, though I have dear friends who do just that. These days, my collection is primarily made up of a variety of triple-milled soaps. The triple-milling process involves a special machine that shreds and rolls the soap until it becomes a smooth paste-like substance. This shredding and rolling is done ̶ yup, three times! I’m not a soap snob, but most sources of bath soap information agree that French triple-milled varieties are the highest quality. The name is deceiving, because a triple-milled soap isn’t necessarily produced in France. 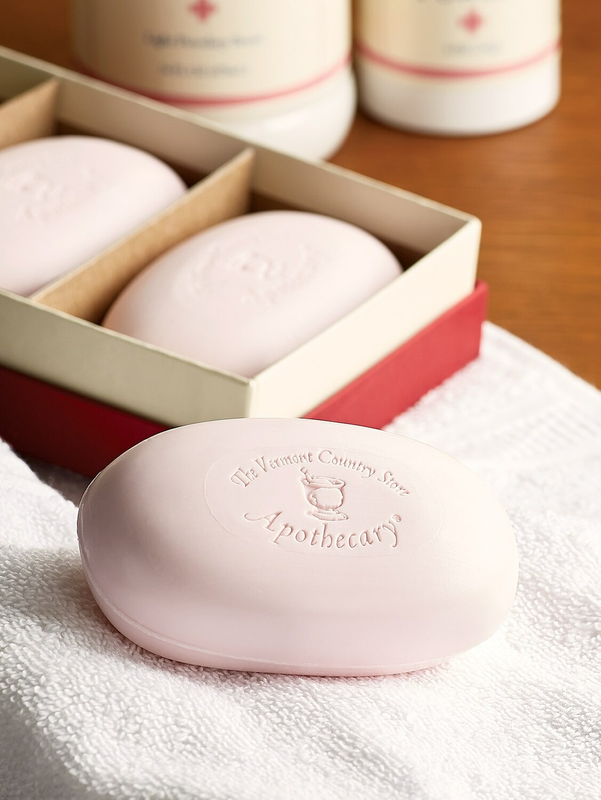 The triple-milling process was invented by traditional French soap makers in France in the 1700s. The nation’s name has stuck, perhaps as homage to its role in this quality-enhancing process. There are always plenty of bars of The Vermont Country Store’s triple-milled soaps in my stash. These natural soaps have a gentle, all-vegetable base and are made in Winooski, Vermont (not far from where I live) using the Old-World French triple-milling method. I give them high marks in five key characteristics of the best soaps I’ve ever used. I’m squeezing waterlogged Rose soap as hard as I can! The number one reason most folks use soap is to get clean, and though we usually don’t think of the chemistry behind this process, it’s an important factor in soap quality. A soap molecule is actually a chain of carbon atoms. One end of the chain attracts water and the other attracts oil. And because I was never very good at chemistry, I’m going to jump right to the point: A soap must have the proper balance. If it has too much of a cleansing ingredient, the oil grabbing part can irritate the skin by washing away the top dirty layer as well as the protective layer of surface oils on the skin. Loads of Citrus Deodorant lather from a slither. I remember standing on a wooden stool in front of the bathroom sink as a child, having fun making a soapy, lathery wet mess. Most adults like a soap that lathers, too; the balance of fun bubbles and soothing, cleansing cream is what makes lather so satisfying. I recently learned that the best soap makers distinguish bubble lather and creamy lather, striving to create the perfect balance of each in their products. And to further complicate the issue is the matter of constancy. Have you ever noticed how some soaps start out lavishing you with lather and about halfway through the bar it fizzles out? The Vermont Country Store soaps produce an abundance of rich lather, right down to the tiniest sliver. Soap conditioners refer to emollients — what’s left behind on the skin after you rinse, and they vary depending on the type of soap a person prefers. For example, if you have dry skin, you should look for a soap with moisturizing emollients which will prevent water evaporation. 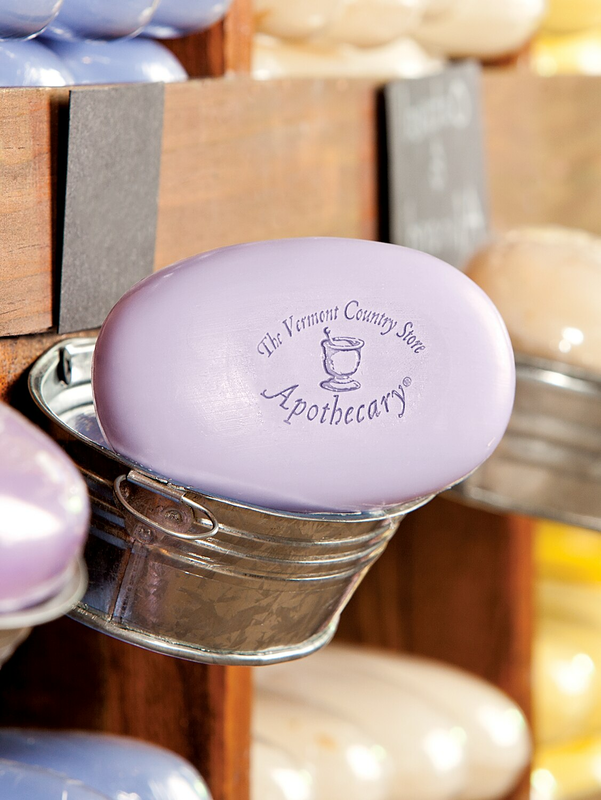 The Vermont Country Store soaps are available in several varieties, so depending on your preferences, you’ll find the perfect soap to pamper your skin. I’m a real sucker for scented soaps, and I’m in good company. If you’re a people watcher, you’ll have noticed that one of the first things most folks do is pick up a bar and stick it under their nose. It’s an essential factor in the do-I-buy-it decision-making process. Some people can’t tolerate fragrance of any kind. I feel sorry for them because aromas evoke a rich, unique combination of personal memory and immediate physiological experience. Fragrances are part of who we are; they are simple pleasures that enrich our daily life. They calm us, invigorate us, make us smile and, let’s be honest – they mask our body odors. The Vermont Country Store soaps are made with naturally-based fragrances such as essential oils, rather than potentially harsh chemically-based fragrances. Their fragrances are true, never overpowering, and each bar smells good to its very end. To help you find your new favorite, here’s a brief overview of each of The Vermont Country Store soaps. Oatmeal & Almond sloughs away unproductive skin cells and moisturizes the skin below with oat flour and penetrating almond oil. English Lavender is celebrated for its calming qualities and is gentle to the skin with rich, moisturizing glycerin. Citrus Deodorant is moisturizing, with a citrus scent and the natural antiseptic and antibacterial qualities of Australian tea tree oil and baking soda. Lemon Verbena has a refreshing citrus fragrance and contains AHA extracts, natural fruit acids that help smooth rough, dry skin and retain moisture. Sandalwood contains sandalwood extract to calm and moisturize skin, and anti-oxidant vitamin E to help protect cells from free radicals. Its fragrance entices with hints of spice and earth. Rose is lushly fragrant, containing rose oil extract to keep your skin silky smooth with its natural regenerative and moisturizing agents. Lilac, with its natural slightly astringent quality, helps soothe skin. Like the spring flower, its fragrance is refreshing and invigorating. 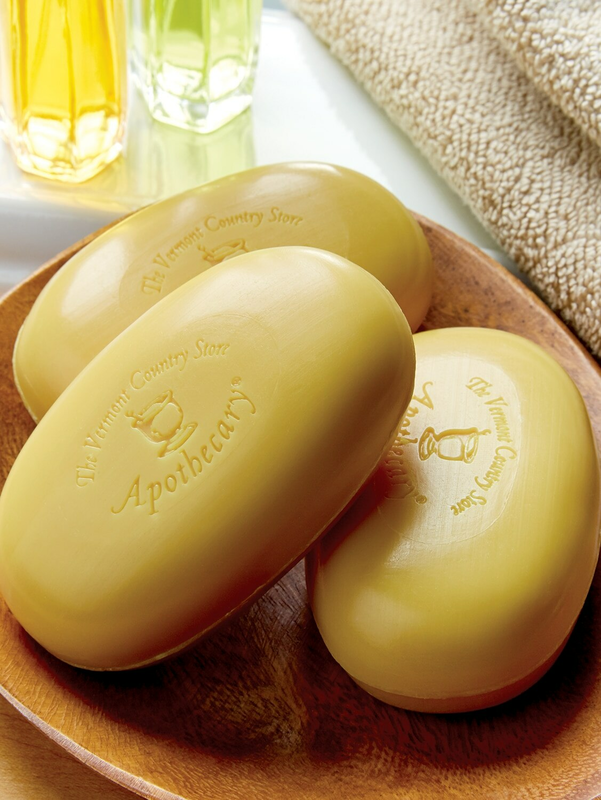 You’ll find all of The Vermont Country Store soaps, as well as many other quality soaps, in our Weston and Rockingham stores and at www.vermontcountrystore.com.